Dybala's early strike was the difference between the sides at Old Trafford as United lost for only the second time in 24 home games in the Champions League. SCORE: 0-1, min. 17, Dybala. INCIDENTS: UEFA Champions League Group H match between Manchester United and Juventus, held at Old Trafford. 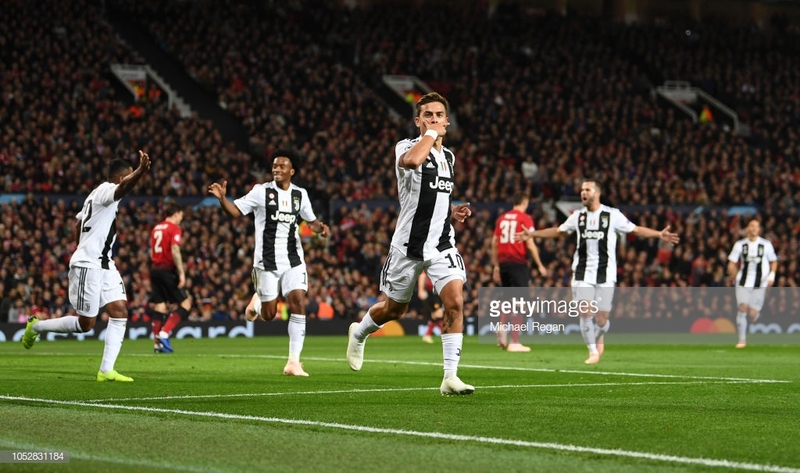 Juventus made it three wins from three in the UEFA Champions League as they defeated Manchester United 1-0 at Old Trafford to move five points clear of the Red Devils in Group H.
Paulo Dybala's 17th minute strike was enough for the Old Lady to seal the win as they once again showed their defensive prowess to see the game out without killing the game off with a second goal. For the first time since December 2017, Jose Mourinho named an unchanged starting eleven for the game after his side's 2-2 draw against Chelsea at Stamford Bridge on Saturday. For the visitors, as expected, Cristiano Ronaldo was named in the starting eleven against his former side. Straight from kick-off, the Old Lady dictated the play with lots of possession and that led to them taking the lead in the 17th minute. The goal came after United failed to clear a great cross from Ronaldo into the box which fell to Dybala, who calmly slotted the ball home past David de Gea to give the visitors exactly what they deserved. They almost made it two with their next attack when more great passing saw João Cancelo find space just outside the United penalty area, before unleashing a great strike which De Gea made a great save from. The Spanish stopper was called into action again just after the half hour mark when he first saved a Ronaldo free-kick, before making another save from a Blaise Matuidi follow up shot. United then finally started to show something in the game for the final ten minutes of the first half by trying to string some passes together but they struggled to get through a strong Juventus defence. At half-time, the scoreline was kind to the hosts as they were totally dominated but they would have gone into the break thinking that if they started quicker in the second half they might get some joy in the game. United did start with more intensity at the start of the second half but they could have conceded on the break. Ronaldo once again threatened to score but he saw a great shot from the edge of the box brilliantly saved by De Gea. After the hour mark, though, United started to control possession more in the game with the visitors keen to sit back and hit United on the break. The hosts huffed and puffed for an equaliser and they were very unlucky not to get one when a brilliant turn and shot from Paul Pogba from the edge of the box hit the post with Wojciech Szczęsny beaten. Mourinho's men continued to pile on the pressure but the visitors showed just why they have the best defence in the world as they sniffed out any danger that United created. The Old Lady made it three wins from three in the group, while United sit second with four points from three games and face a daunting trip to Turin to face Juventus again in two weeks time.